Evildoers of Gotham City, beware! Batman statue stands 18-inches tall on a gargoyle-themed base. The Caped Crusader is highly detailed in his gray and black suit. Expand your Super Powers… collection, that is! Here comes the Caped Crusader, making his way into the DC Super Powers line of highly detailed statues from Tweeterhead. 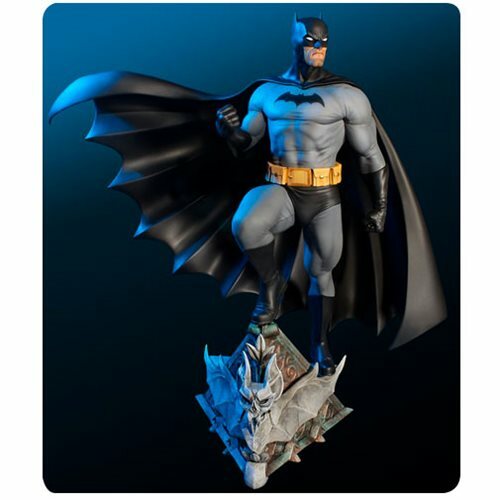 With a look of pending justice for the evildoers of Gotham City, the Batman variant edition stands about 18-inches tall on a bat-gargoyle-themed base. Made of polyresin, he's presented in his classic gray and black suit.